SCSI(English: Small Computer System Interface),an independent processor standard of system level interfaces used between computer and intelligent devices (hard disk, floppy drive, CD-ROM, printers, scanners). It is a kind of intelligent universal interface standard. It can communicate with a variety of types of peripheral devices. SCSI uses ASPI (advanced SCSI programming interface) standard software interface and allows the communication between driver and SCSI adapter installed inside computer. 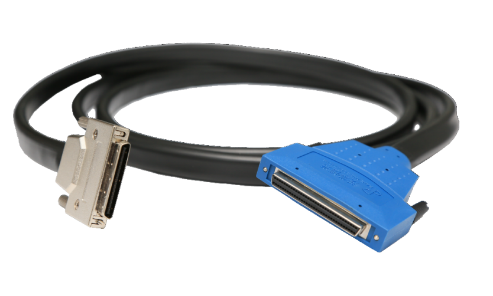 SCSI interface is widely used in high speed data transmission technology on the minicomputer. The SCSI interface has the advantages of wide application range, multi task, high bandwidth, low CPU occupancy rate, and hot swap etc. The SCSI bus has 9 control signal:ATN, BSY, ACK, RST, MSG, SEL, C/D, REQ, I/O, the bus activity of bus is completely decided and realized by these control signals. These signals is controlled by Initiator or by Target or jointly controlled by two. The status of C/D, SEL, MSG, BSY, SEL determines what stage the bus situates. In different stages, the combination of signals on the bus is different. (1) ATN: the attention signal, is usually set by initiator when initiator has message sent to Target. (2) BSY: when the SCSI device is in the busy state, occupy the data bus, the signal is set to true. (3) ACK: response signal, reseted by the Initiator, as confirmation for REQ/ACK requesting response data transmission. (4) RST: SCSI bus reset. (5) MSG: reseted by the Target in the stage of message. (6) SEL: used when Initiator selects Target or Target selects Initiator again. (7) C/D: Indicate the control signal or data information signal. (8) REQ: reseted by the Target, indicates requesting to process a REQ/AC K handshake data transmission. (9) I/O: indicate the direction of current data transmission.